Deep wave bundles deal on sale at affordable price. Wholesale 10 bundles of human deep wave virgin hair at the best price. Bundles are all made with human virgin hair that are cut from healthy donors. Each bundle is measured to be in true length and weighs about 100g, full length and full weight. 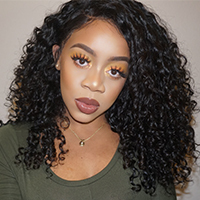 Deep wave has a good quality hair texture like our other hair types, the hair could keep their wave texture for a long time, if you do a regular conditioning, the hair will have no tangling and no shedding. Besides, purchase our virgin hair can enjoy free exchange and return service, as well as our US Domestic Service.